On Wednesday January 10, 2018 FFA members traveled to West Holt to compete in the District X Leadership Development Events. Students have been working hard the past few months on speeches concerning issues or hot topics in agriculture, preparing for the quiz bowl competition and preparing to demonstrate safety practices used within the agriculture industry. Faith Rasmussen, Emma Green, Taryn Klabenes, and Jenae Whitaker competed in the junior high quiz bowl competition that tested their knowledge on agriculture equipment, terms, and practices. 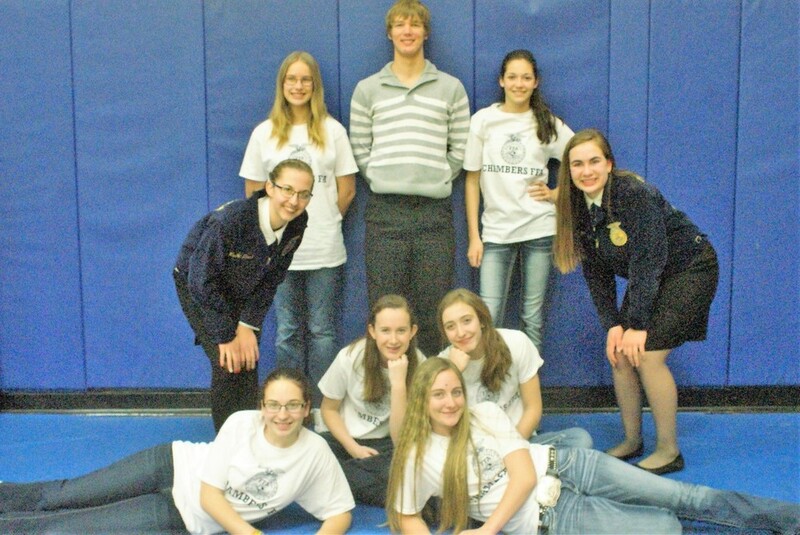 This team will be advancing to the state competition which will be held during the Nebraska FFA State Convention in April. Sydney Beed represented the Chambers FFA in the Senior Public Speaking Event where she educated judges on the Red Angus cattle breed and its importance in the agriculture industry. Logan Sanford gave a speech on Global Warming for Natural Resources Speaking division. Megan Homolka brought an interesting perspective with her speech on the controversy behind Pheasant Stocking and made it to the final round in the Junior Public Speaking division. Michelle Koenig, Brooke Ehlers, Nicole Nichols, and Mary Walnofer used their research and wit to conduct a demonstration on the procedures and practices used in extracting a victim from a grain bin engulfment accident. All members worked hard on their projects and competed well. Congratulations and job well done!